Jeff Sekerak - Live like a beast. To be fit like a beast. You can too! Live like a beast. To be fit like a beast. You can too! Do you see animals in the wild up all night, drinking and partying? Do you see them consuming masses of altered, processed foods? And do you see them breaking down physically, and prematurely aging? Not unless they are domesticated by Man! Here's a brief, but useful bit on how to be more like a healthy animal in the wild - and less like a misguided, 'civilized' human. What kind of wildlife do you see in Kep, Cambodia, where I'm now visiting? Birds, rising early with the sun. Lizards, some of the greatest athletes on earth, running along walls and trees. Insects of various types, all seemingly bursting with energy. I did a workout this morning, ending with a run by the ocean. 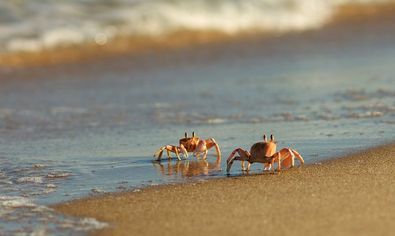 And I was amazed at just the speed of the crabs on the beach. They live in small holes dug into the sand. When they see you coming - they just explode with a natural power, and dart into their little homes. Seeing all these creatures got me to thinking, just how unusual a creature is Man when compared to these beings. They exude only vibrant energy and joy. The birds in the air, the lizards, the insects, the crabs on the beach. I thought: It's difficult to even determine their age. As their health seems to remain constant and vibrant, throughout their lives. Well on my beach run this morning, he appeared a bit 'out of place' by comparison. I saw overweight children. I saw people drinking alcohol, early in the morning. I also saw quite a few severely large human specimens, dragging themselves along. While they consumed a wide variety of highly questionable, food-like substances - 'breakfast burritos,' fries, sodas and other processed items. It seemed that eight of the ten people I saw were overweight. They lacked energy. They appeared prematurely aged. In short? They were a FAR cry from the beautifully healthy, vibrant wildlife in the area. Go to bed early. Rise early. Exercise each day as if your life depended upon it. Allow no poisons to enter your body - no alcohol, no drugs, no processed foods. And eat the right foods for your species. If you are a human being, this means healthy plant foods. Lots of fruits and vegetables! NOT acid-producing meats, dairy or other animal fare. Do you see the birds, lizards, insects, crabs and other creatures, consuming over-cooked, or processed 'foods?' Do you see them overfeeding themselves? Do you see them drinking alcohol or other poisons? And do you see them missing a day of vigorous exercise? No. They would not survive if they sinned against their own bodies like this. As Man so often does. Live as they do. Live more like the 'beasts of the wild,' starting today. And you'll recapture the health, power, and sheer joy to be alive that they possess, as a matter of course. Copyright 2015, Jeff Sekerak. All rights reserved. Consult your doctor before engaging in any diet or fitness plan.